There was a time when I really did try to keep up. In years past I was not only covering the local wine scene a bit more directly when I was food editor of Seattle magazine. But I also traveled to Bordeaux, France, with the team from the Washington Wine Commission to translate at the booth for VinExpo (the world’s largest wine trade show, or at least it was at the time, early 2000s). I tried to stay on my game by reading up on the new wineries, keeping track of goings-on in the various appellations, flipping through Wine Spectator to see what was considered news-worthy about Washington wines from their perspective. But the pace of growth in wine making in Washington state has been such that it’s nearly impossible to stay on top of all the new developments going on. The folks at Costco asked me to write a cover story on Washington wine for their magazine in 2005. At the time I wrote of the “dynamic wine-making region [that is] in constant growth and evolution,” enthusiastically noting that the state had come to be home to 350 wineries. How’s this for dynamic? In the six years since I wrote that article, the number of wineries has DOUBLED, now counting over 700. It’s astonishing, and exciting, and it keeps us local wine lovers on our toes. And there were a couple surprises along the way. 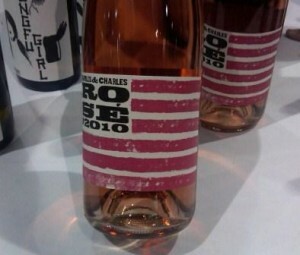 It was fun to chat with the folks at Cartel Wine Group who were, in fact, pouring their first release here at the show. They call themselves “modern-day négociants”; rather than growing or buying grapes and making the wine from fruit to bottle, they instead buy freshly-pressed grape juice and make wine from that. It’s a bit of a short-cut, though there’s plenty of personality to still inject in that blending/aging process. And the bottom line for the customer is affordability: their Seeing Red Cabernet retails for $10 and the Seeing White Chardonnay for $9. They do have a Bordeaux-style blend called The Surveyor that sells for a whopping $13. 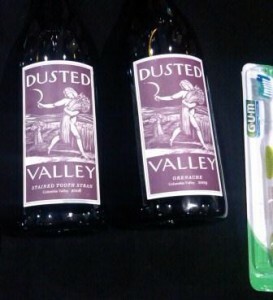 One of the best $13 bottles of wine I’ve sampled in some time…… Interestingly, these are non-vintage wine, meaning there’s no year listed on the label — leaving them free to blend juices from different years into the same bottle. If the wine’s good — keep in mind that much of the best Champagne out there is non-vintage — I’m all for mixing up the years! As I paused at the Pomum Cellars table, which had been a recommended detour for my day’s itinerary, winemaker Javier Alfonso dipped his hand below the table and pulled up a bottle of white wine. One of the bigger surprises of the day was that someone — well, Javier, to be exact — is now making wine with Albariño, a Spanish white wine grape, in Washington. Over the years of attending Taste Washington, one of the most interesting measures of change has been the increased variety of wine grapes being used. At first Sangiovese was quite the departure from Cabernet Sauvignon and Merlot, then there was Temperanillo, Malbec, this year it was fun to see a few Carmenere wines being poured. This will be the year I remember my first taste of Washington Albariño. Delightful reflections on Washington’s blossoming industry. Thank you for sharing.